Coverage: Watch live on BBC TV, HD, Red Button, Connected TV, online, tablets, mobiles and BBC Sport app. Full details here. 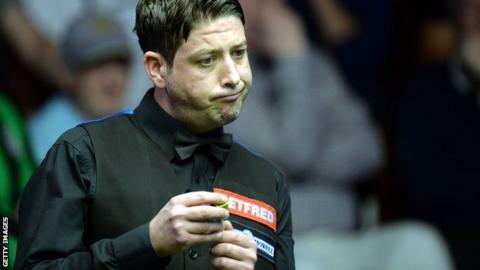 Former world champion Terry Griffiths hopes fellow Welshman Matthew Stevens can return "a lot stronger" next season. Ronnie O'Sullivan put Stevens, 37, out in round two at The Crucible. Griffiths says Stevens had bounced back from a divorce and being declared bankrupt to reach the World Championship. "Matthew can take a lot of good out of this and hopefully he'll come back a lot stronger next season," he said. "Like everything else in life, when your back's against the wall you can go so far and then when you hit the wall you start to get better. "And I think that's actually what's happened." Griffiths, who won the world crown in 1979, says Stevens was "very upset" over the collapse of his marriage. The twice-beaten Crucible finalist was declared bankrupt at the High Court in January after a petition lodged by HM Revenue and Customs. "It will affect you on the table - there's no doubt about it, it did affect Matthew," Griffiths said. "I don't think he put enough practice in; he didn't feel like practising. He didn't feel like doing anything and you can understand that. "But he's come through that now. He's been working a lot harder." Stevens beat fellow countryman Mark Williams 10-2 in round one before facing O'Sullivan in the last 16. The Carmarthenshire player beat the five-time world champion in the Welsh Open in February but he was outclassed at The Crucible, and lost 13-5.